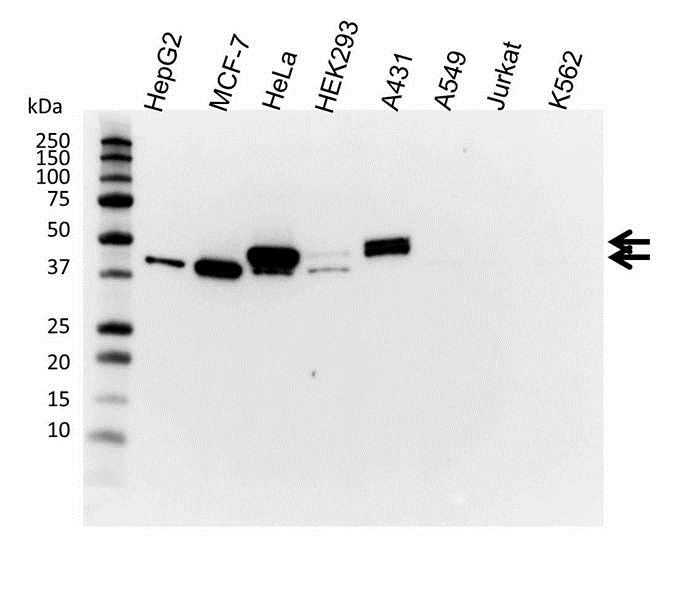 Western blot analysis of whole cell lysates probed with cytokeratin 19/20 antibody (VMA00009) followed by detection with HRP conjugated Goat anti Human IgG F(ab')2 (1/2500, STAR126P) and visualized on the ChemiDoc MP with 5 second exposure. Arrows point to cytokeratin 19/20 (molecular weight 40, 45 kDa). Cytokeratin 19/20 antibody recognizes human cytokeratin 20, and cross reacts with cytokeratin 19, also known as type I cytoskeletal 19 or keratin-19. The antibody has been extensively validated for western blotting using whole cell lysates. Human anti Human cytokeratin 19/20 antibody recognizes human cytokeratin 20, and has been demonstrated to cross-react with cytokeratin 19. In immunohistology reactivity is seen both with tissues expressing only CK19 and with those expressing only CK20. Human anti Human cytokeratin 19/20 antibody recognizes cytokeratins 19 and 20 as bands of ~40 kDa and ~45 kDa respectively by western blotting under reducing conditions. Anti cytokeratin 19/20 antibody detects bands of approximately 40 kDa and 45 kDa in HeLa cell lysates. A bivalent human recombinant Fab selected from the HuCAL® GOLD phage display library, expressed in E. coli. This Fab fragment is dimerized via a helix-turn-helix motif. The antibody is tagged with a myc-tag (EQKLISEEDL) and a his-tag (HHHHHH) at the C-terminus of the antibody heavy chain. This product is supplied as a liquid.